Are you supposed to be an ambassador for Jesus and His Kingdom? The world and its media have various views about Christianity and how Christians are supposed to live. But many of those views are NOT based upon the Bible or the practices of real Christians. Do you know that Christians are supposed to be Ambassadors of the kingdom of God? Do you know how a Christian really is supposed to live? Can early Christian history give us any clues? Can you accept biblical commands and instructions? This is book is filled with many scriptures in order that the sincere may better learn how God wants His people to live. A way very different than that lived by most who claim Christianity. 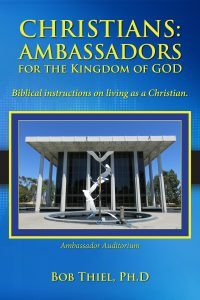 Here is a link: Christians: Ambassadors for the Kingdom of God, Biblical instructions on living as a Christian.